In this tutorial I will show you how to get the best Frames Per Second (FPS) and reduce lag. This will make your minecraft experience a lot more enjoyable. There are a number of ways to increase your FPS and reduce lag, some are a lot easier and cheaper than others. In this tutorial I will be teaching you how to install 2 mods for Windows and Mac, the way I show you, is the way to install most mods for a client, not a server. 1. Close all programs you do not need or aren't using. 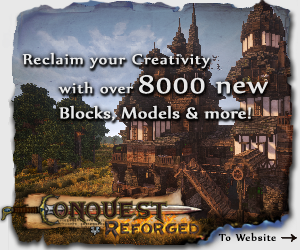 To download Single Player Commands, you first need to press download after clicking on the link. Open your .minecraft and open bin. Delete your META-INF it will only delete if your minecraft is closed. Once the download has completed. Open the download, you will see a lot of files. Highlight them all, drag and drop them into your minecraft.jar. Click add and replace files. You have successfully installed Single Player Commands. You should see a tab that says 'Switch to Game Box', if not close Game Booster and then restart it. When you are in your game box, you will see and 'Add' button with a small + next to it. Click that and search for minecraft (Or any other game you want in there). When you find it double click it. It will appear in your Game Box then click on it so it is highlighted and then press 'Boost & Launch'. Minecraft will launch through Game Booster, your screen may change, that is fine and normal, it means Game Booster is working. To download Optifine, you first need to press download after clicking on the link. You have successfully installed Optifine. Open minecraft and go to the options page, you will see it has grown massively. The screen shots below will show you the best settings to have to get the best FPS you can. Once you click options this will come up straight away. Change your settings to the ones shown. Change your settings to look like these. Then click on the details tab and change the settings as shown in the next picture. Change your settings to look like these. Then click on the quality tab and change the settings as shown in the next picture. Change your settings to look like these. 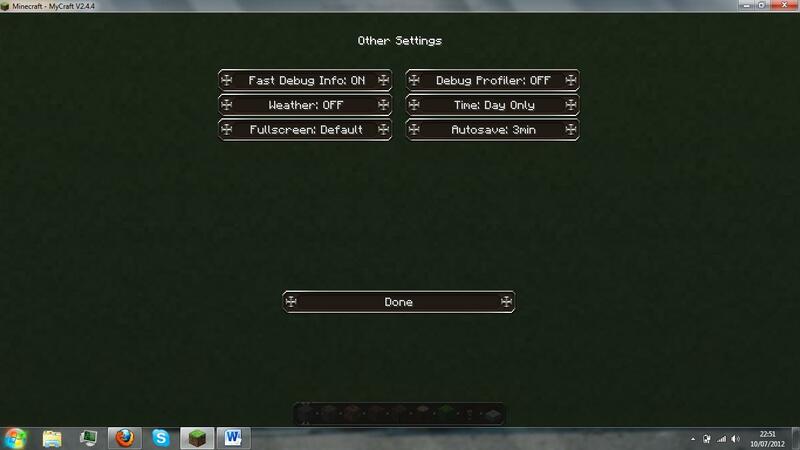 Then click on the animations tab and change the settings as shown in the next picture. Change your settings to look like these. Then click on the performance tab and change the settings as shown in the next picture. Change your settings to look like these. Then click on the other tab and change the settings as shown in the next picture. With these settings Optifine has done all it can do. 5. 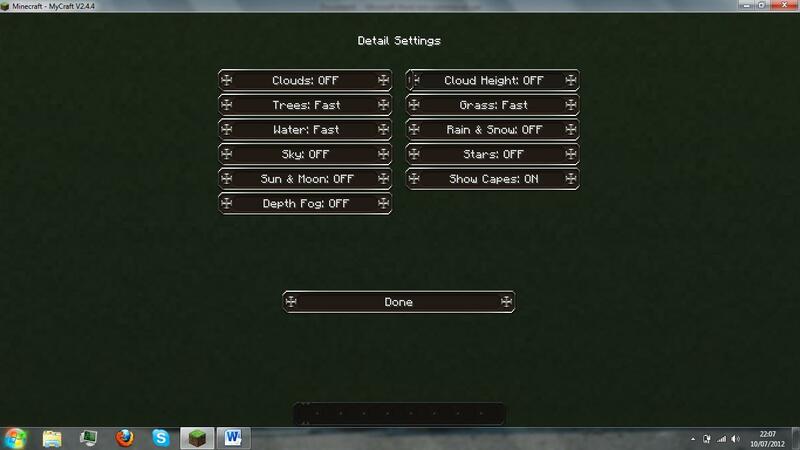 If you do not want to download Optifine, then you can just turn down your render distance and turn off animations. 6. If you are on a laptop and playing online/over the internet, use a wired connection, that always helps me. 7. The texture pack you use can have a great impact of your FPS. Lower resolution texture packs with increase your FPS (E.G 16x16 will give you higher FPS than a 64x64 texture pack). There is a myth that I will dispel. A 'blocky' texture pack or a 16x16 texture pack shaded in a 2x2 style does not increase FPS, your computer will still have to load the pixels even though they are the same colour. 8. If you are playing on a server / over the internet and there is another user using the same bandwidth as you, you might find you get more lag. As hard as it is, try and make sure you are the only person on the bandwidth. If your router is on a open network, put a password on it, this will make sure you are the only person on that bandwidth as well as making your internet accounts are safer. 9. Update java and lwgjl. I hope this helps anyone who like me hasn't got the best, most powerful computer or laptop. If this has helped you please diamond the blog. If any links do not work, comment which one it is and I will fix the links. Updated the blog for 1.7.2. Other changes to layout and words. You are my last hope. I have tried a lot of stuff, but i can't find anything, that is similar to my situation... I have a powerful computer. Everything is running great on single player on max stats, even tekkit is using max 10% of my video card and maybe 20% of cpu. But i don't care about single player, me and my friend were playing tekkit on my server, everything was great, until the low fps came. The situation is - we were building a lot of stuff, like ALOT, most of things were based on electronics, but thats not the point, i had made up red matter farm, but i wanted to go bigger, when i builded a farm from 2 stacks of macerators and everything was great until i connected timer, to make my filters work, and then it started - from vsync - 60fps to 1fps to me and my friend, if i switch it of, it works great again on aprox 60fps, but when i start everything it goes to 1fps and mc kicks out me of server. it is so annoying, when i have like 5 fps my computer is using aprox 5gb of 8 gb ram, cpu is going on 4,4 ghz at 20% and gpu 30% on aprox 200mhz (1176mhz total), HOW CAN YOU EXPLAIN THAT? We stoped playing tekkit because it got so annoying, what shuld i do? Mark that - Java is up to date, java has now high priority, i have tried to allow tekkit to use different ram memory, starting from 1 to 8, doesn't change anything, lowered my video settings to minimum, doesn't change anything, and by the way network is using almost nothing, maybe 50kbit, i have searched on internet what to do, but can't find anything. I haven't actually played the game in probably just under 2 years, and I have no idea about half the in game things you're talking about, but it sounds like you're overloading your graphics card. If it is struggling it is not all that unlikely it will not give out accurate readings when you're measuring speeds. Redstone is very resource intensive, it can slow down the best servers with the nest hardware. I would suggest you try isolating parts of the redstone circuit and seeing if there are any specific parts of it that cause the game to lag and crash. If there are, work on those to make them more efficient. 11: setting the priority from java to high. 12 is number 10, and 11 is good, but I found (when I did it on my laptop 3 years ago) it didn't help all that much. Might have just been me though. Oh. I didn't read 10 xD. On my Old Computer, Nothing worked. 99% CPU... 5 fps. 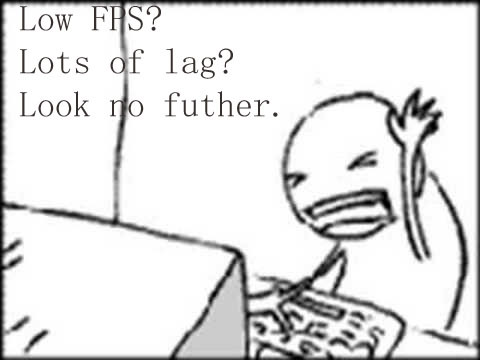 FPS mostly depends on the PC hardware. -BUT updating Java and lwgil DID help a lot so... diamond, wait did I diamond this already? I don't know .__. Optifine and Game Booster make quick PCs slow. Updating Java and Iwgii works for everything. You need to infuse your server with swag first. Also, what should be boosted? The MC jar file or the launcher? The jar file I would imagine. wait it might be becuase of the setting on mc whats this update?? You need the latest versions of the mods if you're using the latest version of the game. If you aren't using a mod, then don't worry. Souds like it is a server issue as single player is fine for you. I'm not sure with Gameboost; I just wanna use Readyboost if I can find a spare USB. My dad has one, and plays games with an external drive and Readyboost. The result: A hyper gaming laptop. Sounds great! I would love a laptop that could stay on for more than 30 minutes without a battery, a good gaming laptop would blow my mind. He uses a trick; he removes the battery and charges the laptop so it would change to a desktop. It makes the laptop faster because it does not need to maintain battery level. Nice idea, doesn't work with Windows 7, or Vista, I think it was one of those, but it doesn't work anymore. if i follow ALL the things and i sometimes have 0 fps at a cpuusage of 100% and a usage of the Ram at 100%! that means mc uses the complete cpu and doesn't do anything! Optifine makes good PC's have a worse minecraft performance. It could be your computer. I advise you defrag your hard drive and run anti-virus scans. Also, have you downloaded minecraft or do you play through a browser? I downloaded Minecraft and optifine and minema are making higher fps, but when i build a big box and place the last block, inside of the box is no light anymore. the lightchangeing is the problem...I'm building a giant statue with 8x8 pixels so there are REALLY big squares with no light. And the only way to take a foto of it is with a MCEdit screenshot. If it is light, place a torch? I'm not sure how else I could help. SOrry. Its not a torch, its the opposite! It only laggs when light areas getting dark. Oh... I have no idea about that, sorry. when from 30-35 to 255fps! I dont understand why everyone getss such a bad FPS. I have a really bad computer (Radeon HD6370 and Intel Pentium i3) but I normally get 30-40 FPS. Dude, I've had my FPS at zero before. Yes, zero. 0. No hyperbole. It also depends on how good your internet connection is and what background tasks your computer is doing. This is what the world needs. + Diamond + Subscribe + Favorite. Thanks man. I can actually play Minecraft now.